Ten years ago, a couple of street children working and living in Delhi took the initiative to form themselves into Badhte Khadam – Walking Forward. They were tired of their voices not being taken into consideration, and decided to create their own newspaper to express themselves freely and loudly. To help them succeed, they received support from Chetna, an NGO that works with street children. Today, this federation has more than 10,000 of members in North India and will soon be publishing the 50th edition of Balaknama, Children’s Voices. Sadly, in India there are more than 60 million children who are forced to work. The power of the pen informs them about the value of education and many continue their education through distance learning. Usually, Balaknama’s reporters are between 12 and 17 years old, and they write about the struggles of working children’s life o the street. They also cover stories of success and bravery, as well as giving their opinion on both drugs and abuse. 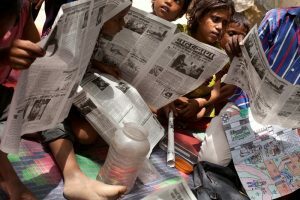 They report missing children and inform their readers about labour and education laws – after all , there is no better person to speak about slum children than themselves. Despite their personal challenges, these slum kid reporters find the energy to support and help others.